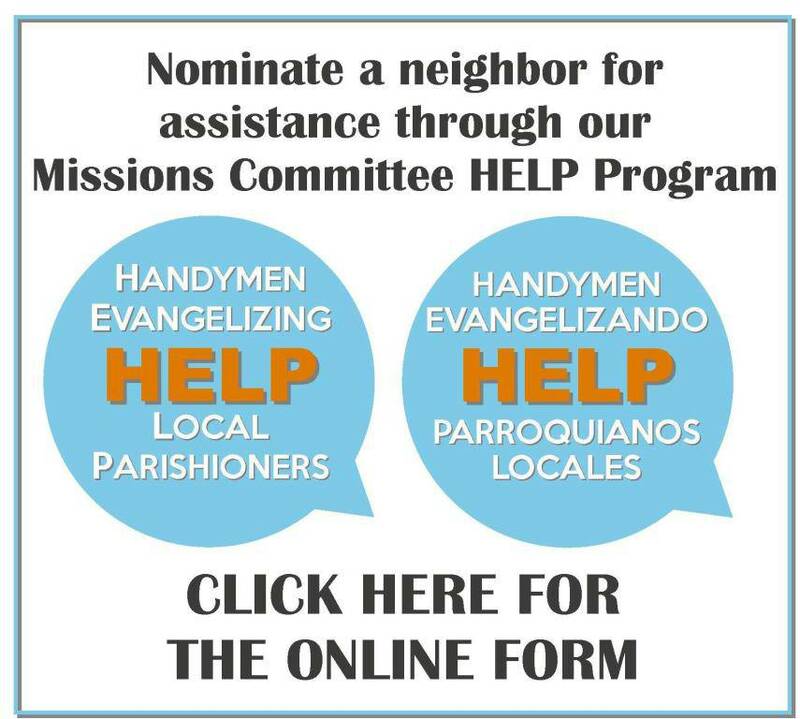 The primary role of the Missions Committee Ministry is to create and maintain missionary service opportunities for parishioners. The “new evangelization” calls each of us to be Christ’s eyes, ears, hands and feet; serving, evangelizing, and ministering to our brothers and sisters in most need. The approach is to form long-term partnerships with existing organizations that meet certain criteria for Christian service. A “menu” of local, regional, and international missionary service options are made available for individuals, couples, youth, and families to share their time, talent, and treasure. Pack the Pantry: Food and supply donations are requested from parish families the first weekend Masses each month. Donations are split and delivered to Bethlehem House and Soul Food Café to keep their food pantries stocked throughout the year. CoHo: Supporting City of Hope Outreach (CoHo) ministries in the Oakwood and Brookside communities, volunteers work to maintain facilities and assist with programs. Missions for Transitions: Volunteers assist with setting up households (furnishings & supplies) for individuals and families transitioning from Bethlehem House, CoHo, or The Women’s Shelter. Handyman Services: Serving local communities, handymen provide home maintenance, repairs, and disaster response (i.e. tornado damage) for parishioners and others in need. Summer Family Mission: A structured week-long mission for entire families through the Family Mission's Company. Coming summer of 2017. St. Luke’s Parish: Supporting one of the most depressed parishes in Arkansas, St. Luke’s in Warren, missionaries work side-by-side with parishioners to maintain facilities, support the sacraments, and enhance formation programs. Men of Faith Appalachia Mission: Men of the parish travel to one of the poorest counties in the United States – Floyd County, Kentucky - to perform a weekend of home repair and maintenance projects through Hand-in-Hand Ministries. Honduras Medical Mission: In partnership with Christ the King Honduras Mission, missionaries travel to Trujillo, Honduras. Trips are offered in January and June of each year. Medical and dental professionals are always needed, along with construction, teachers, and administrative helpers (anyone is qualified, bilingual is not a prerequisite). The Missions Committee also performs other administrative functions related to missions on behalf of the parish. Missionary Cooperation Plan: Members of the Missions Committee accept and vet applications from organizations outside of the Diocese of Little Rock that wish to make an appeal to the parish concerning missions. Approved applicants are then coordinated and scheduled on the parish calendar. Confirmation Service Days: In cooperation with the Confirmation coordinator, committee members create and schedule opportunities with partner organizations for parish youth preparing for Confirmation to fulfill their “Service Days” requirements.